The euro crisis, several sovereign debt crises, the Great Recession, the refugee crisis, and Brexit have all challenged Europeans’ willingness to show solidarity with other European citizens and member states of the European Union. European Solidarity in Times of Crisis provides a clear theoretical framework to understand European solidarity for the first time. 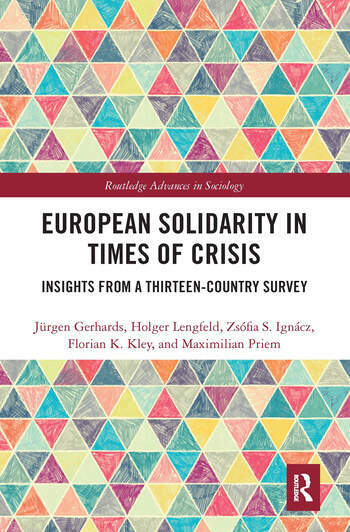 It offers a systematic empirical approach to determine the strength and causes of European solidarity. The authors distinguish between four domains of solidarity and test a set of theoretically derived criteria with a unique dataset to investigate European solidarity. Based on a survey conducted in thirteen EU member states in 2016, the empirical analysis leads to some unanticipated results. Europeans display a notably higher degree of solidarity than many politicians and social scientists have presumed so far. This especially applies to the support of people in need (welfare solidarity) and the reduction of territorial disparities between rich and poor EU countries (territorial solidarity), but also to the domain of fiscal solidarity (financial support of indebted EU countries). This optimistic view is less true for the domain of refugee solidarity. While citizens of western and southern EU countries accept the accommodation of refugees and their allocation between European countries, the majority of people in eastern European countries do not share this point of view. The book will appeal to students and scholars in fields such as comparative sociology, political science, social policy and migration research, and European studies. It is also relevant to a non-academic audience interested in the development of the European project. Jürgen Gerhards is Professor of Sociology at the Freie Universität Berlin. His research interests include comparative cultural sociology, and sociology of European integration. His most recent publications include Global Inequality in the Academic System: Effects of National and University Symbolic Capital on International Academic Mobility (Higher Education, 2018, with S. Hans & D. Drewksi); Social Class and Transnational Human Capital. How Upper and Middle Class Parents Prepare Their Children for Globalization (Routledge, 2017, with S. Hans & S. Carlson); European Citizenship and Social Integration in the European Union (Routledge, 2015, with H. Lengfeld); Transnational Linguistic Capital. Explaining English Proficiency in 27 Countries (International Sociology, 2014); European Integration, Equality Rights and People’s Beliefs. (European Sociological Review, 2013, with H. Lengfeld); From Hasan to Herbert: Name Giving Patterns of Immigrant Parents between Acculturation and Ethnic Maintenance (American Journal of Sociology, 2009, with S. Hans); Free to Move? The Acceptance of Free Movement of Labour and Non-Discrimination among Citizens of Europe (European Societies, 2008). Holger Lengfeld is Professor of Sociology at Leipzig University and Research Fellow at the German Institute of Economic Research Berlin. His research focuses on social stratification, inequality and European social integration. Among his publications are Does Physiological Distribution of Blood parameters in Children Depend on Socioeconomic Status? Results of a German Cross-sectional Study (BMJ Open, 2018, with K. Rieger, M. Vogel, C. Engel, U. Ceglarek, K. Harms, U. Wurst, M. Richter, W. Kiess); Drifting Apart or Converging? Grades of Non-traditional and Traditional Students over the Course of Their Studies (Higher Education, 2017, with T. Brändle); Do European Citizens Support the Idea of a European Welfare State? (International Sociology, 2016, with J. Gerhards & J. Häuberer); The Long Shadow of Occupation: Volunteering in Retirement (Rationality and Society, 2016, with J. Ordemann); European Citizenship and Social Integration in the European Union (Routledge, 2015, with J. Gerhards); The Growing Remit of the EU in Climate Change Policy and Citizens’ Support across the Union (Journal of European Social Policy, 2008, with J. Gerhards). Zsófia S. Ignácz is a lecturer and researcher at the Institute of Sociology, Goethe University Frankfurt, Germany. Her main research interests include social justice and methodological topics. Her most recent publications are The Remains of the Socialist Legacy: The Influence of Socialist Socialization on Attitudes toward Income Inequality (Societies, 2018); Social Cohesion and Its Correlates (Comparative Sociology, 2018, with J. Delhey, K. Boehnke, G. Dragolov, M. Larsen, J. Lorenz, M. Koch); Wage Distribution Fairness in Post-Socialist Countries (Routledge, 2018); Social Cohesion in the Western World (Springer, 2016, with G. Dragolov, J. Lorenz, J. Delhey, K. Boehnke & K. Unzicker). Florian K. Kley is a researcher and lecturer at the Institute of Sociology, Leipzig University, Germany. Previously, he was a researcher in the HORIZON 2020-Project, Solidarity in European Societies: Empowerment, Social Justice and Citizenship (SOLIDUS) at the Chair for Societal Institutions and Social Change at the Institute of Sociology at Leipzig University. His main research fields are European social integration, social stratification research, and quantitative data analysis. Maximilian Priem is a data analyst at DIW Econ GmbH, Germany. Previously he worked as a researcher in the project European Solidarity at the Chair of Macrosociology at the Freie Universität Berlin. His main research interests include European sociology, inequality and living conditions. His most recent publication is Everyone Happy: Living Standards in Germany 25 Years after Reunification (DIW Economic Bulletin, 2014, with J. Schupp).